Public: Approximately 5 members of the public. · Spoke in support of the proposal. The Presiding Member Mayor Emma Cole thanked Mr Van De Feltz for his comments. There being no further speakers, Public Question Time closed at approximately 6.08pm. 4.1 Mayor Cole Requested a Leave of Absence From 13 April 2018 to 22 April 2018. That Mayor Cole request for leave of absence be approved. That the minutes of the Ordinary Meeting held on 6 March 2018 be confirmed. That the minutes of the Special Council Meeting held on 27 March 2018 be confirmed. Yesterday we had a visit from the Minister for Transport the Honourable Rita Saffioti and the Local Member for Perth John Carey MLA who announced they will be contributing 50% towards the build of new Loftus Street Bike Lanes, which the City has been seeking to fill a gap in our bike network for about two years now. The bike lanes will cost approximately $420,000 and it is a $210,000 contribution each from ourselves and State Government. We are very much looking forward to receiving the grant which will provide an important connection to Leederville, Beatty Park through to Bulwer Street bike lanes. Oxford Street bike lanes and our Shakespeare Street Boulevard that is currently under construction. This weekend we are opening Hyde Street Reserve, which has been a fantastic project that has been community driven with great support from neighbours and residents in the area where we have converted a small section of low use road to adjoin the park that is now 50% larger than when we started. This will be very popular with families and has a fully fenced playground for the many young children that will go there. So 11am on Sunday please come along and see what you can achieve when you take a bit of road and use in-house resources with our own engineering team delevering this project all for the very low cost of $120,000 plus a $20,000 grant from our Federal Member for Perth Tim Hammond for some solar lighting in the park. On Saturday we will be having our Annual Native Plant Sale and this year we will be adding a Sustainability Hub. There will be free advice and information from a range of experts on sustainability issues with Water Corporation there advising on water safety issues plus a range of ideas on solar. A Compost and Wormfarm Workshop will also be included and our Waste Management Team will be on board to provide updates on waste as well. We have been quite successful in the awards category. We have been successful and won a “Place Process Award” in the City of Vincent at the 2018 Place Leaders Asia Pacific Awards. This is quite an achievement for our Policy and Place Directorate. It is basically saying we have an inavative way of committing to local base place making and that the jury was impressed by our approach generally and our exceptional level of intergration across all relevant stakeholders including our Town Team, which is now something that is taking off not just in the Perth Metro area but across Australia so that is fantastic to see. Also a shout out for a group of our staff on winning the Western Australian Round of the 2018 Australasian Management Challenge that saw staff from across various Directorates working together to represent the City against a number of other WA Local Governments and later will be flying to Canberra to represent WA and Vincent in a National Challenge. So well done to these staff members. The Community Budget Submissions are open right now after having successfully been run for the past two budget years. We are again calling on our community to put forward ideas for Council cprojects and priorities that they would love to see happen in their community. To give an example, we have a number of those projects that community members put forward previously that are happening right now such as the Braithwaite Park Toilet Block which is due to start construction in a couple of weeks, and was a great initiative that came through from community members. The City does fund these fantastic initaives from the community. It really does happen. 8.1 Cr Topelberg declared an impartiality interest in item 9.3. – No. 131 (Lot 282: D/P:2503) Coogee Street, Mount Hawthorn. The extent of the interest being that Cr Topelberg has a professional relationship with one of the adjoining neighbours. Cr Topelberg declared that he will consider the matter on its merits and vote accordingly. 8.2 Cr Topelberg declared a proximity interest in Item 9.6 – North Perth Town Centre Parking - Six Month Review of Parking Restrictions. The extent of the interest being that Cr Topelberg’s primary residence lies within the area that is subject to the parking restrictions. Cr Topelberg did not seek approval to participate in the debate or to remain in the Council Chamber or vote on the matter. 8.3 Cr Murphy disclosed an impartiality interest in item 11.1. The nature of the interest being that through his work on the Leederville Carnival he has a professional relationship with Mr Peter Capes who is the CEO of Subiaco Football Club. Cr Murphy declared that he will consider the matter on its merits and vote accordingly. 8.4 Cr Castle disclosed an impartiality interest in item 11.1. The nature of the interest being that through her work for Leederville Connect, which ended in February 2018, she had a professional relationship with Peter Capes, who is the CEO of Subiaco Football Club. 8.5 The Chief Executive Officer, Len Kosova declared a financial interest in item 18.1 – Proposed Amendments to Chief Executive Officer’s Employment Contract. The extent of his interest being that this matter relates to his remuneration and his contract of employment with the City. Items 9.3, 9.6, 11.1 and 18.1. (ii) $16,202.20 for Subiaco Football Club Inc.
2. APPROVES a waiver of variable outgoings, turf maintenance and utility recoupments for both East Perth Football Club Inc and Subiaco Football Club Inc for the 2016/17 financial year totalling $29,839.87 (incl GST), as listed in Attachment 2, for the reasons outlined in this report, SUBJECT TO immediate payment of the outstanding balance for that period by each club, being $38,145.74 each. 3. NOTES that East Perth Football Club Inc and Subiaco Football Club Inc have paid all variable outgoings, turf maintenance and utility costs as invoiced by the City for the 2017/18 financial year. 6. Subject to final satisfactory negotiations being carried out by the Chief Executive Officer, AUTHORISES the Mayor and Director Corporate Services to affix the common seal and execute the variation of leases as set out in 4. and 5. above. That Council NOTES the Investment Report for the month ended 28 February 2018 as detailed in Attachment 1. That Council RECEIVES the Financial Statements for the month ended 28 February 2018 as shown in Attachment 1. 2. REQUESTS that a further report on this matter be presented to the Ordinary Council Meeting on 29 May 2018 following the completion of more detailed parking occupancy surveying over a one month period. 2.1.3 The street setback of the proposed awning is not consistent with the setback of dwellings along the existing streetscape. 5.4 The area shown for manoeuvring in front of the proposed Units 1 and 2 shall remain unobstructed at all times. 5. The proposed outdoor living areas do not meet the Design Principle, of Clause 5.3.1 of State Planning Policy 3.1: Residential Design Codes as these spaces do not provide adequate access to winter sunlight and ventilation or provide adequate amenity for residents. That recommendations 1, 2 and 3 be deleted and the remaining recommendations be re-numbered accordingly. The Proposed Amendment lapsed for want of a Seconder. Against: Mayor Cole, Cr Castle, Cr Loden. Prior to occupation or use of the development, all stormwater collected on the subject land shall be retained on-site by suitable means to the satisfaction of the City. That the matter be DEFERRED for consideration at a future meeting. That the approval be granted for a 12 month period and will then be subject to a review. That the matter be DEFERRED to enable the Applicant to address streetscape, setback, bulk and scale and visual privacy issues within their application. Cr Topelberg declared a proximity interest in item 9.6 and left the meeting at 7.41pm prior to consideration of the item. 2.2 The community feedback received since the implementation of the North Perth Town Centre Parking Restrictions and Administration’s comments on this feedback, as shown in Attachment 3. At 7.45pm Cr Topelberg returned to the meeting. 4.3 Certified Copy of entry – Relationship Declaration Register. 5.2 That the table titled “CPI INCREASES FROM JULY 2009” be deleted. That Council RECEIVES the Information Bulletin dated April 2018. (d) the names of all members who voted for and against all motions where the vote is not unanimous. 3. NOTES that Cr Harley and Cr Castle intend to request that voting decisions be recorded by name except where an unanimous vote has been recorded. 4. NOTES that Cr Harley will request her voting decision be recorded as a State Councillor. 3. NOTES that Cr Harley and Cr Castle intend to request that voting decisions be recorded by name except where a unanimous vote has been recorded. 4. NOTES that Cr Harley will request her voting decision be recorded by name as a State Councillor except where a unanimous vote has been recorded. 5. REQUESTS that administration give consideration to the carbon emissions which result from the management of waste as part of the current Waste Management Strategy. That recommendation 2 be deleted and the remaining recommendations be renumbered accordingly. 4.4. Include Investigate plans for the City to create an electric vehicle fleet or other technology that can achieve zero emissions as part of forward purchasing practice. 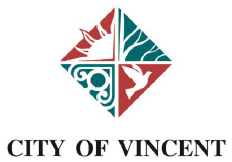 Pursuant to Section 5.23(2) of the Local Government Act 1995 and clause 2.14 of the City of Vincent Local Law Relating to Standing Orders, the Meeting proceeds “behind closed doors” at the conclusion of the items, to consider confidential Item 18.1. At 8.49pm all staff members including the CEO, Len Kosova left the meeting and live streaming was stopped. IN ATTENDANCE: No members of staff were present. The Chief Executive Officer, Len Kosova, has disclosed a financial interest in this matter as it relates to his performance and remuneration in the role of CEO and his contract of employment with the City. (1) All business conducted by the Council at meetings (or any part of it) which are closed to members of the public is to be treated in accordance with the Local Government (Rules of Conduct) Regulations 2007. Confidential reports are provided separately to Council Members, the Chief Executive Officer and Directors. In accordance with the legislation, confidential reports are to be kept confidential until determined by the Council to be released for public information. At the conclusion of these matters, the Council may wish to make some details available to the public. 2. AUTHORISES the Mayor to execute on Council’s behalf an amendment to the CEO’s contract of employment to reflect the consent and conditions referred to in 1 above. These Minutes were confirmed by the Council as a true record and accurate of the Ordinary Meeting of the Council held on 4 April 2018.